Realtors Do You Understand the 5 Levels of Twitter Acceptance? One of the best tools for measuring your commitment and understanding of the micro-blogging power Twitter.com comes from social media marketing superstar Rohit Bhargava the inventor of Social Media Optimization. 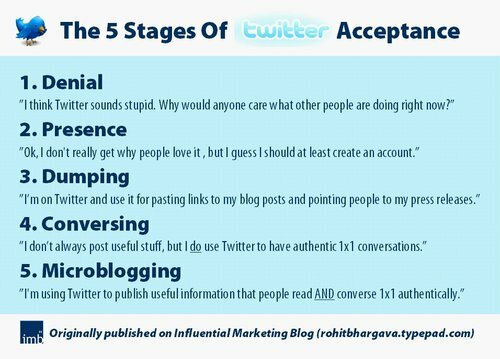 In his article “The 5 Stages of Twitter Acceptance” Rohit has brilliantly and accurately outlined the evolution of many Twitter users. The graphic clearly highlights each stage and it acts as a measuring tool to those who have progressed forward in their acceptance.